No estate of inheritance or freehold in lands or tenements can be conveyed unless it is done so by a deed in writing, subscribed and delivered by the party disposing of the estate, or by that party's agent authorized in writing (33-401). 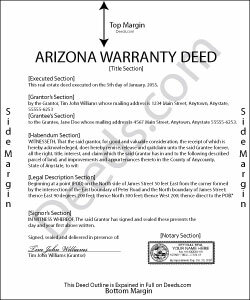 In Arizona, warranty deeds are used more than special warranty deeds are used. The statutory form for a conveyance is provided in 33-402 of the Arizona Revised Statutes. A warranty deed, by the use of the word "convey," contains the following implied covenants: (1) That previous to the time of execution of the conveyance, the grantor has not conveyed the same estate or any right, title, or interest therein to any person other than the grantee and (2) That at the time of execution of the conveyance, the estate is free from encumbrances (33-435). Warranty deeds are similar to general conveyances, but provide further assurances through the use of the phrase "I hereby convey and warrant the title against all persons whomsoever" (33-402). A warranty deed must be signed by the grantor and must be duly acknowledged before an officer authorized to take acknowledgements in Arizona or in another state (33-401b). If acknowledged out of state, it can be done so before a notary public, a judge, clerk, or deputy clerk of a court of record, or any other person authorized to perform notarial acts in the state in which the act is performed (33-501). A document, such as a warranty deed, evidencing the sale or other transfer of real estate or equitable interest therein should be recorded by the transferor in the county where the property is located and within sixty days of the transfer (33-411.01). The act of recording a warranty deed provides constructive notice to subsequent purchasers or encumbrance holders for valuable consideration without notice (33-411). An unrecorded warranty deed is valid and binding between the parties and their heirs, and as to all subsequent purchasers with notice thereof, or without valuable consideration (33-412).